The RL3000 is another high quality covered trailer produced by Woodford and available from Marsden Barn Trailers. 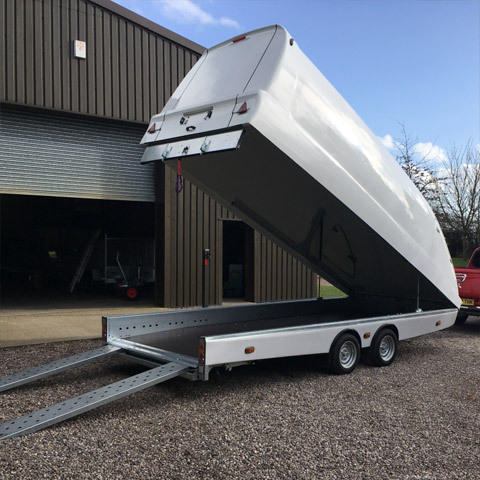 This trailer has a very well designed bed with a beavertail enabling racing and classic vehicles with bodywork close to the ground to carefully load and unload without damage via two 6′ pull out metal ramps. It has twin axles and runs on 12” wheels. The RL3000 comes with different size options and payloads. The bed length is 16′ with width options of 6′ 3" or 6′ 11". Payloads starting at 1490kg up to 1900kg are possible depending on the trailer configuration. The trailer uses two very powerful gas struts to operate the clam shell for ease of opening. For ease of access to equipment there are removable hatches at the front of the trailer on each side. Hydraulic tilt beds and electric winches are optional extras available for this trailer.